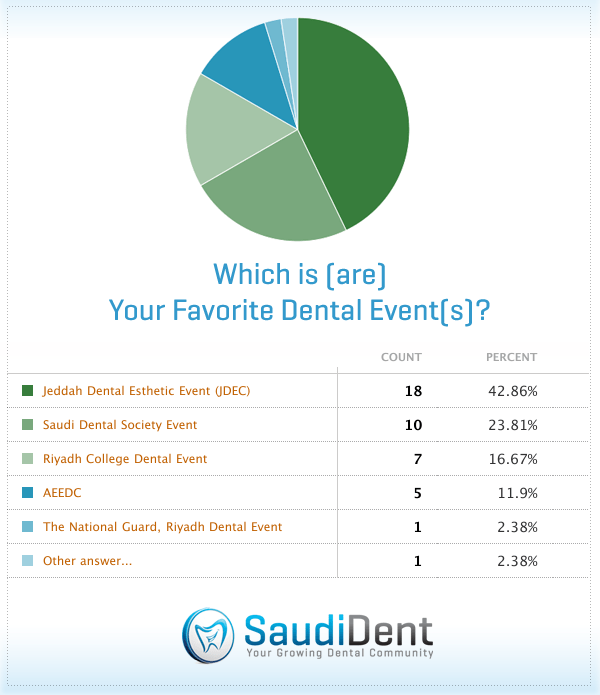 In our first poll we have raised the question on which is (are) your favorite dental event(s)?, we have received 42 votes of which 42.86% voted for Jeddah Dental Esthetic Conference as their Favorite Dental Event. 23.81% voted for The Saudi Dental Society Annual Conference. 16.67% voted for Riyadh College Dental Meeting. 11.9% voted for AEEDC event. 2.38% voted for National Guard Dental Event-Riyadh. And 2.38% voted for others. Of course these are not a scientific findings as the purpose is to sense the general views of dentists attending those events which I believe give some basic impression that would help dental events organizers to tweak their scientific functions accordingly.